In this review, I will take a look at the Teeter EP 960 LTD Inversion table. 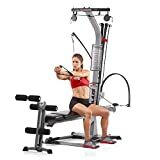 I will point out the features and benefits of this inversion table, as well as who should consider buying this model. So, let’s get right to it. Sit back, relax and let’s take a look at this model from Teeter. 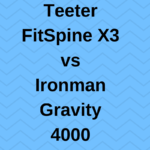 There are many options when it comes to inversion tables, and Teeter has been in the game for a long time. I personally own a Teeter inversion table and have been very happy with it. Teeter is a leader in innovation when it comes to the inversion table. 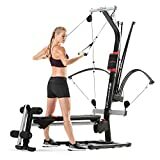 User height and weight limit: Not to exceed 6’6” tall and the unit is rated for 300 pounds. There are a lot of different reasons people suffer from back pain. It could be tight muscles, a herniated disc, spinal stenosis, etc. Before you begin using an inversion table, I definitely recommend a visit to your doctor first, to make sure you are fit to use one. There are certain conditions which make using an inversion table a bad idea for some people. Because people come in all shapes, sizes, heights, and weights, the inversion table is very customizable for each individual. Ankle locking system: One of my favorite features of this particular model is the ankle system. I love the extended handle which locks and unlocks your ankles from the inversion table. The extended handle means that you don’t have to bend over very far when you want to secure or release your ankles. I can’t tell you how valuable this is when you are in a position where you can’t bend over, or you experience pain when you bend over due to back problems. I have been there, and I know all too well how painful it can be to bend forward when you have specific back pain. The contoured ankle supports help to surround your ankle and distribute your body weight evenly, so you don’t feel the weight of your body all in one spot when you are inverted. This is a great feature, as I have used inversion tables where the ankle supports are not all that comfortable, and it can actually hurt to be inverted. You can try things like using a towel on the tops of your feet for added comfort, but with the Teeter EP 960 LTD, you should not have to do that. The adjustable foot platform allows you to set the right height as it moves up and down. The appropriate footbed height will be different for everyone, so you have the option to customize the height of the footbed so the ankle supports will feel good. Depending on how much room you need for your ankles, front to back, the contoured ankle supports are adjustable, with the extended handle. You can make micro adjustments to get the best fit for you. You don’t want the ankle supports to be too tight or too loose, so you have the option to customize the fit. As for the actual table itself, the part you lay on, it is made of a comfortable, yet firm plastic material that is contoured for a comfortable fit. Some inversion tables come with a padded back, but this platform is very comfortable and allows your back to breathe. There are cutouts which can be used as handles so you can grab ahold and get a twist in if that feels right for you. The table comes with a small pillow as well so you have something comfy for your head to rest on. There are slots in the table platform which serve as anchor points for the acupressure nodes. Acupressure nodes provide trigger point release which can really help with tight muscles. The table also comes with a lumbar bridge that attaches right to the table and targets your lower back. This will help with decompression of the low back area. 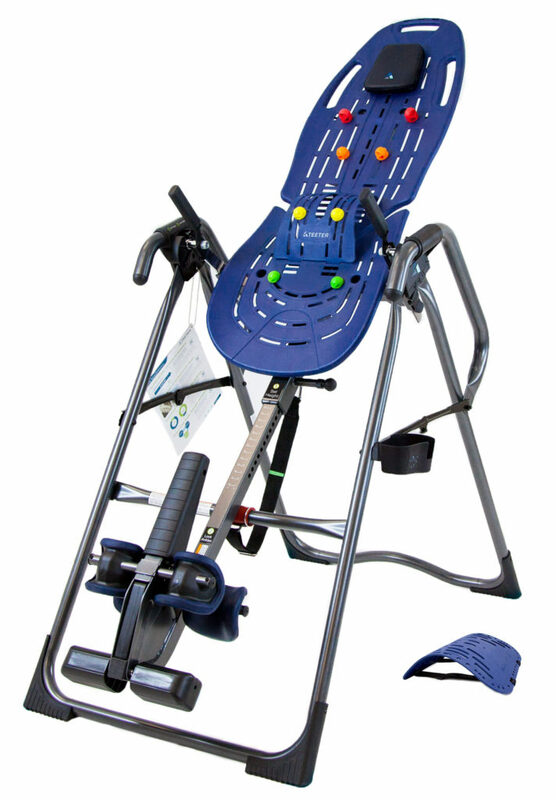 Traction handles are included with this Teeter inversion table as well. These handles allow you to get a deeper stretch at a lesser angle of inversion. As an example, when I started using an inversion table, my back was pretty messed up. I was only able to invert at a shallow angle, about 15-20 degrees. The traction handles allow you to add decompression at lesser angles, by pushing on the handles. The traction handles also help out if you want to oscillate while using the table. Oscillation is where you kind of teeter-totter up and down, using a pumping action. This can be an effective way to use an inversion table and get fluids flowing to the painful areas. Different inversion tables have different methods for achieving the desired angle of inversion. Some use a tether strap, and some use a mechanical pin device. This particular table uses the tether strap. I am fond of the tether strap as this allows you literally to set the angle wherever you want it. The strap comes with preset markings, so you can easily find the right angle whether it is 20, 40, 60 degrees, etc., or anything in between. Extra-long handles make returning to the upright position easy and also allow you to add a particular variety of stretches while you are inverting. Some people will grab on to one side with both hands and get an extra stretch on each side of the body. The Teeter inversion table has a height adjustment based on the individual user height. This is done using the locking pin and height adjustments on the shaft. Typically you can set the height to how tall you are. Occasionally you will need to make a slight adjustment depending on the individual. For a proper height fit, you should be able to easily lay back on the inversion table by extending your arms over your head. You should be able to return to the upright position with arm movements as well. If it is difficult, or you are stuck in the inverted position, you can pull yourself up with the handlebars and try another setting. For instance, if you are 6’0″ you may need to use the 6’1″ mark. You will need to play with this and find the right fit. The table is adjustable for users up to 6’6″, and user weight of 300 pounds. Storage is pretty straightforward with this model, and you do not have to take it apart to store it. The unit will fold up, and you can put it in a corner, or closet. I will tell you this table will not easily fit under a bed, unless you take it apart, even then, it’s challenging, depending on how high your bed is off the floor. I lean my inversion table in a corner in my bedroom. It doesn’t really make my wife all that happy, but it’s the best alternative for us. You can move the table and put it where you want it, but it is not very easy. This unit weighs about 70 pounds. I speak from experience that moving a 70-pound inversion table when you have a back problem, is a problem. I would recommend storing and using the machine in a place like a bedroom, or basement, where you won’t have to move it far to set it up. Assembly is a snap, as the inversion table comes about 85% assembled and should only take about 30 minutes to finish the job. It is helpful to have some around to give you a hand finishing assembly. Inversion tables can help to relieve pain from many conditions including, sciatica, muscle tension, and herniated discs to name a few. Using your body weight, and gravity, inversion tables are used to decompress and rejuvenate the spine. Improved flexibility and less muscle tension can help you feel and move better. I use an inversion table frequently to deal with my back problems, including sciatica and I feel like it helps me. I hope this review has been helpful and you have the information necessary to make an informed decision on this Teeter inversion table. There is a lot to like about this inversion table, and as I said, I own a Teeter myself. I think this is something you can buy once and have it for many years to come. If you are interested in purchasing this inversion table or would like more information, click the link below. For other great inversion table options, click here. I hope that I have answered many of your questions. If you have any further questions or comments, please leave them below, and I will get back to you as soon as I can. I’ve never heard of a device like this before. Are there any downsides or side effects using an inversion table? Thank you for your comment William. Yes, there are certain medical conditions that people have and should not use an inversion table. It’s best to check with your doctor to see if you are fit for an inversion table. It’s best to be careful and start at a shallow angle to see how your body will react. I wished I had known about this inversion table years ago; someone close to me had really bad back problems and this would have been very helpful. By the way, how often and for how long do you recommend using this inversion table? Hi Carmen, thanks for stopping by. Inversion tables can provide some pain relief and help people who are recovering from injuries, I am proof of that. As for time, you can start with just a few minutes at a shallow angle, like 15 degrees and work up from there. Teeter says to use it every day, but I use mine a few times per week. I invert at about 60 degrees. Thanks again for stopping by, I appreciate it. This is so cool! I’ve seen Teeters advertised before, but have never used one. My husband certainly could have used an inversion table a few years ago when he was dealing with a herniated disc. t’s definitely beneficial for those of us that suffer from all sorts of back problems. Great article. Thanks for sharing your knowledge. Thanks for your comment Patty, I appreciate it. I never really thought about using an inversion table for back stiffness, so this is a good option to consider. Do you know if using an inversion table can help decrease the chance of developing sciatica and other back pain related issues? 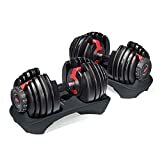 Thanks for the review and information on this product! Hi Jeremy, thanks for your comment. An inversion table helps to reverse the effects of gravity and helps to elongate the spine. It allows the discs a chance to rejuvenate and recover. I use mine to deal with my sciatica pain. Preventing sciatica is a tough one since a lot of times this is caused by a herniated disc, and a herniated disc can be caused by many things. I use my table as a preventative measure and to help out when I have sciatica pain.